Welcome! 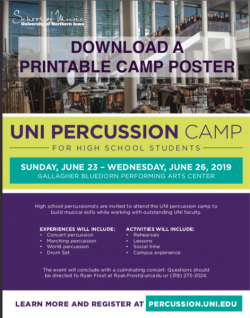 Thank you for your interest in the University of Northern Iowa Percussion Camp! This four-day event is designed for high school students who are interested in improving their musical skills in a variety of percussion areas. Campers will participate in daily ensemble rehearsals, masterclasses, campus experiences, and a culminating concert. The camp is intended for high school students, those going into 9th grade and above. Includes tuition, room and board from Sunday evening dinner through Wednesday evening dinner at the Piazza Dining Center. Roommate requests must be received no later than one week before camp begins or you will be placed in a room with a student your own age. Camp size will be limited to ensure campers receive quality instructional time. Registration will be on a first come first served basis. Be sure to sign up today! Registration closes on Friday, May 24, 2019 or when spots are full.